Jawaharlal Nehru (Hindi/Kashmiri: जवाहरलाल नेहरू, pronounced [dʒəʋaːɦərˈlaːl ˈneːɦru]; 14 November 1889–27 May 1964) was an Indian statesman who was the first (and to date the longest-serving) prime minister of India, from 1947 until 1964. One of the leading figures in the Indian independence movement, Nehru was elected by the Congress Party to assume office as independent India's first Prime Minister, and re-elected when the Congress Party won India's first general election in 1952. As one of the founders of the Non-aligned Movement, he was also an important figure in the international politics of the post-war era. He is frequently referred to as Pandit Nehru ("pandit" being a Sanskrit and Hindi honorific meaning "scholar" or "teacher") and, specifically in India, as Panditji (with "-ji" being a honorific suffix). The son of a wealthy Indian barrister and politician, Motilal Nehru, Nehru became a leader of the left wing of the Congress Party when still fairly young. Rising to become Congress President, under the mentorship of Mahatma Gandhi, Nehru was a charismatic and radical leader, advocating complete independence from the British Empire. In the long struggle for Indian independence, in which he was a key player, Nehru was eventually recognized as Gandhi's political heir. Throughout his life, Nehru was also an advocate for Fabian socialism and the public sector as the means by which long-standing challenges of economic development could be addressed by poorer nations. Jawaharlal Nehru was born to Motilal Nehru (1861–1931) and Swaroop Rani (1863–1954) in a Kashmiri Pandit family. The Nehru family - Motilal Nehru is seated in the center, and standing (L to R) are Jawaharlal Nehru, Vijayalakshmi Pandit, Krishna Hutheesing, Indira Gandhi, and Ranjit Pandit; Seated: Swaroop Rani, Motilal Nehru and Kamala Nehru (circa 1927). Nehru was educated in India and Britain. In England, he attended the independent boys' school, Harrow, and Trinity College, Cambridge. Jawaharlal Nehru at Harrow, where he was also known as Joe Nehru. During his time in Britain, Nehru was also known as Joe Nehru. On 8 February, 1916, Nehru married seventeen year old Kamala Kaul. In the first year of the marriage, Kamala gave birth to their only child, Indira Priyadarshini. 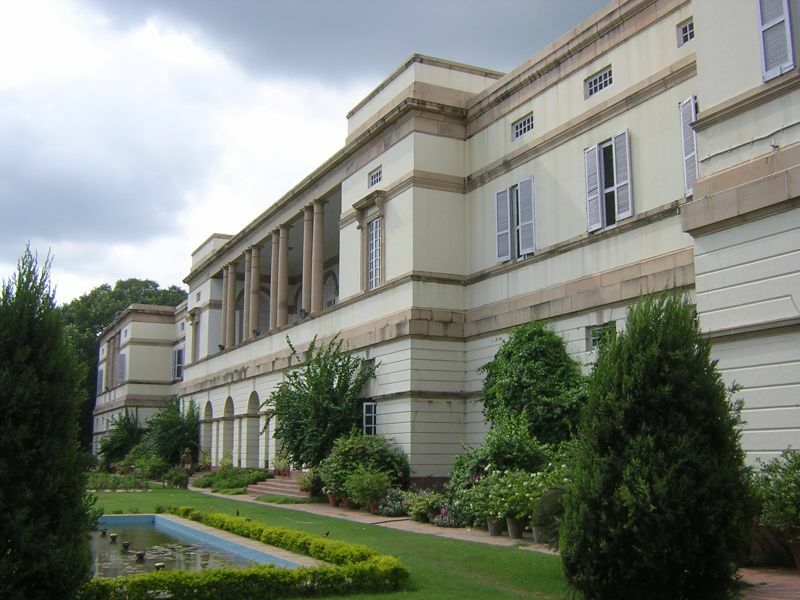 Teen Murti Bhavan, Nehru's residence as Prime Minister, now a museum in his memory. Once elected, Nehru headed an interim government, which was impaired by outbreaks of communal violence and political disorder, and the opposition of the Muslim League led by Muhammad Ali Jinnah, who were demanding a separate Muslim state of Pakistan. After failed bids to form coalitions, Nehru reluctantly supported the partition of India, according to a plan released by the British on 3 June 1947. He took office as the Prime Minister of India on 15 August, and delivered his inaugural address titled "A Tryst With Destiny"
In the years following independence, Nehru frequently turned to his daughter Indira to look after him and manage his personal affairs. Under his leadership, the Congress won an overwhelming majority in the elections of 1952. Indira moved into Nehru's official residence to attend to him and became his constant companion in his travels across India and the world. Indira would virtually become Nehru's chief of staff. 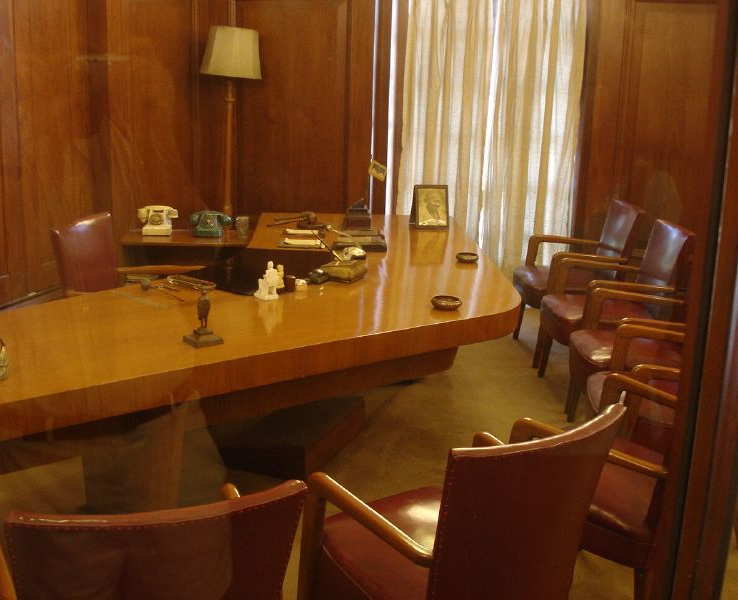 Nehru's study in Teen Murti Bhavan. Nehru presided over the introduction of a modified, Indian version of state planning and control over the economy. Creating the Planning commission of India, Nehru drew up the first Five-Year Plan in 1951, which charted the government's investments in industries and agriculture. Increasing business and income taxes, Nehru envisaged a mixed economy in which the government would manage strategic industries such as mining, electricity and heavy industries, serving public interest and a check to private enterprise. Nehru pursued land redistribution and launched programmes to build irrigation canals, dams and spread the use of fertilizers to increase agricultural production. He also pioneered a series of community development programs aimed at spreading diverse cottage industries and increasing efficiency into rural India. While encouraging the construction of large dams (which Nehru called the "new temples of India"), irrigation works and the generation of hydroelectricity, Nehru also launched India's programme to harness nuclear energy. 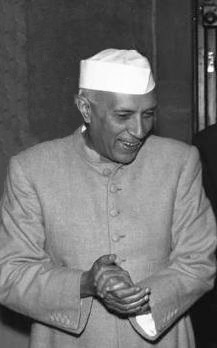 For most of Nehru's term as prime minister, India would continue to face serious food shortages despite progress and increases in agricultural production. Nehru's industrial policies, summarised in the Industrial Policy Resolution of 1956, encouraged the growth of diverse manufacturing and heavy industries, yet state planning, controls and regulations began to impair productivity, quality and profitability. Although the Indian economy enjoyed a steady rate of growth, called Hindu rate of growth at 2.5% per annum, chronic unemployment amidst widespread poverty continued to plague the population. Jawaharlal Nehru was a passionate advocate of education for India's children and youth, believing it essential for India's future progress. His government oversaw the establishment of many institutions of higher learning, including the All India Institute of Medical Sciences, the Indian Institutes of Technology and the Indian Institutes of Management. Nehru also outlined a commitment in his five-year plans to guarantee free and compulsory primary education to all of India's children. For this purpose, Nehru oversaw the creation of mass village enrollment programmes and the construction of thousands of schools. Nehru also launched initiatives such as the provision of free milk and meals to children in order to fight malnutrition. Adult education centres, vocational and technical schools were also organised for adults, especially in the rural areas. Nehru led newly independent India from 1947 to 1964, during its first years of freedom from British rule. Both the United States and the Soviet Union competed to make India an ally throughout the Cold War. On the international scene, Nehru was a champion of pacifism and a strong supporter of the United Nations. He pioneered the policy of non-alignment and co-founded the Non-Aligned Movement of nations professing neutrality between the rival blocs of nations led by the U.S. and the U.S.S.R. Recognising the People's Republic of China soon after its founding (while most of the Western bloc continued relations with the Republic of China), Nehru argued for its inclusion in the United Nations and refused to brand the Chinese as the aggressors in their conflict with Korea. He sought to establish warm and friendly relations with China in 1950, and hoped to act as an intermediary to bridge the gulf and tensions between the communist states and the Western bloc. His policy of pacifism and appeasement with respect to China also came unraveled when border disputes led to the Sino-Indian war in 1962. Nehru was hailed by many for working to defuse global tensions and the threat of nuclear weapons. He commissioned the first study of the human effects of nuclear explosions, and campaigned ceaselessly for the abolition of what he called "these frightful engines of destruction." He also had pragmatic reasons for promoting de-nuclearisation, fearing that a nuclear arms race would lead to over-militarisation that would be unaffordable for developing countries such as his own. Nehru had led the Congress to a major victory in the 1957 elections, but his government was facing rising problems and criticism. Disillusioned by intra-party corruption and bickering, Nehru contemplated resigning but continued to serve. The election of his daughter Indira as Congress President in 1959 aroused criticism for alleged nepotism, although actually Nehru had disapproved of her election, partly because he considered it smacked of "dynastism"; he said, indeed it was "wholly undemocratic and an undesirable thing", and refused her a position in his cabinet. Indira herself was at loggerheads with her father over policy; most notably, she used his oft-stated personal deference to the Congress Working Committee to push through the dismissal of the Communist Party of India government in the state of Kerala, over his own objections. Nehru began to be frequently embarrassed by her ruthlessness and disregard for parliamentary tradition, and was "hurt" by what he saw as an assertiveness with no purpose other than to stake out an identity independent of her father. Although the Pancha Sila (Five Principles of Peaceful Coexistence) was the basis of the 1954 Sino-Indian border treaty, in later years, Nehru's foreign policy suffered through increasing Chinese assertiveness over border disputes and Nehru's decision to grant political asylum to the 14th Dalai Lama. After years of failed negotiations, Nehru authorized the Indian Army to invade Goa in 1961, and then he annexed it to India. It increased his popularity, but he was criticized the use of military force. Since 1959, and this accelerated in 1961, Nehru adopted the "Forward Policy" of setting up military outposts in disputed areas of the Sino-Indian border, including in 43 outposts in territory not previously controlled by India. China attacked some of these outposts, and thus the Sino-Indian War began, which India technically lost, but China gained no territory as it withdrew to pre-war lines. The war exposed the weaknesses of India's military, and Nehru was widely criticised for his government's insufficient attention to defence. In response, Nehru sacked the defence minister Krishna Menon and sought U.S. military aid, but Nehru's health began declining steadily, and he spent months recuperating in Kashmir through 1963. Some historians attribute this dramatic decline to his surprise and chagrin over the Sino-Indian War, which he perceived as a betrayal of trust. Upon his return from Kashmir in May 1964, Nehru suffered a stroke and later a heart attack. He died in the early hours of 27 May 1964. Nehru was cremated in accordance with Hindu rites at the Shantivana on the banks of the Yamuna River, witnessed by hundreds of thousands of mourners who had flocked into the streets of Delhi and the cremation grounds. Nehru's statue in Aldwych, London. In addition, Nehru's stance as an unfailing nationalist led him to also implement policies which stressed commonality among Indians while still appreciating regional diversities. This proved particularly important as post-Independence differences surfaced since British withdrawal from the subcontinent prompted regional leaders to no longer relate to one another as allies against a common adversary. While differences of culture and, especially, language threatened the unity of the new nation, Nehru established programs such as the National Book Trust and the National Literary Academy which promoted the translation of regional literatures between languages and also organized the transfer of materials between regions. In pursuit of a single, unified India, Nehru warned, "Integrate or perish." Jawaharlal Nehru on a 1989 USSR commemorative stamp. In his lifetime, Jawaharlal Nehru enjoyed an iconic status in India and was widely admired across the world for his idealism and statesmanship. His birthday, 14 November, is celebrated in India as Baal Divas (Children's Day) in recognition of his lifelong passion and work for the welfare, education and development of children and young people. Children across India remember him as Chacha Nehru (Uncle Nehru). Nehru remains a popular symbol of the Congress Party which frequently celebrates his memory. Congress leaders and activists often emulate his style of clothing, especially the Gandhi cap, and his mannerisms. Nehru's ideals and policies continue to shape the Congress Party's manifesto and core political philosophy. An emotional attachment to his legacy was instrumental in the rise of his daughter Indira to leadership of the Congress Party and the national government. Many documentaries about Nehru's life have been produced. He has also been portrayed in fictionalised films. The canonical performance is probably that of Roshan Seth, who played him three times: in Richard Attenborough's 1982 film Gandhi, Shyam Benegal's 1988 television series Bharat Ek Khoj, based on Nehru's The Discovery of India, and in a 2007 TV film entitled The Last Days of the Raj. In Ketan Mehta's film Sardar, Nehru was portrayed by Benjamin Gilani. Nehru's personal preference for the sherwani ensured that it continues to be considered formal wear in North India today; aside from lending his name to a kind of cap, the Nehru jacket is named in his honour due to his preference for that style. Nehru was a prolific writer in English and wrote a number of books, such as The Discovery of India, Glimpses of World History, and his autobiography, Towards Freedom. D. D. Kosambi, a well-known Marxist historian, criticized Nehru in his article for the bourgeoisie class exploitation of Nehru's socialist ideology. Jaswant Singh, a former leader of Bharatiya Janata Party (BJP), viewed Nehru, not Mohammad Ali Jinnah, as causing the partition of India, mostly referring to his highly centralised policies for an independent India in 1947, which Jinnah opposed in favour of a more decentralised India. The split between the two was among the causes of partition. It is believed that personal animosity between the two leaders led to the partition of India. Singh was later expelled from the BJP for having favourable views on Jinnah. ^ "The Montreal Gazette". Google News Archive. 9 June 1964. p. 4. http://news.google.co.in/newspapers?id=LZotAAAAIBAJ&sjid=jp4FAAAAIBAJ&pg=7168,1579610. ^ Ramachandra Guha (September 23, 2003). "Inter-faith Harmony: Where Nehru and Gandhi Meet Times of India". The Times Of India. http://timesofindia.indiatimes.com/home/opinion/edit-page/LEADER-ARTICLEBRInter-faith-Harmony-Where-Nehru-and-Gandhi-Meet/articleshow/196028.cms. ^ a b Marlay, Ross; Clark D. Neher (1999). Patriots and Tyrants: Ten Asian Leaders. Rowman & Littlefield. p. 368. ISBN 0847684423. http://books.google.com/?id=7i0jGxysUUcC&pg=PA368. ^ Gopal, Sarvepalli. Jawaharlal Nehru: A Biography. Harvard University Press: 1976. p 20. ^ Science & culture, Volume 30. Indian Science News Association. 1964. http://books.google.com/?id=0y0DAAAAIAAJ&q=%22It+will+require+much+more+than+difference+of+opinion+to+estrange+us%22&dq=%22It+will+require+much+more+than+difference+of+opinion+to+estrange+us%22. ^ Nehru, Jawaharlal (2006-08-08). "Wikisource" (PHP). http://en.wikisource.org/wiki/A_Tryst_With_Destiny. Retrieved 2006-08-08. ^ Farmer, B. H. (1993). An Introduction to South Asia. Routledge. p. 120. ISBN 0415056950. http://books.google.com/?id=UNINAAAAQAAJ&pg=PA120. ^ Som, Reba (1994-02). "Jawaharlal Nehru and the Hindu Code: A Victory of Symbol over Substance?". Modern Asian Studies 28 (1): 165–194. DOI:10.1017/S0026749X00011732. Retrieved on 2008-05-29. ^ Basu, Srimati (2005). She Comes to Take Her Rights: Indian Women, Property, and Propriety. SUNY Press. p. 3. ISBN 8186706496. http://books.google.com/?id=mXgX8rrW6JsC&pg=PA3. "The Hindu Code Bill was visualised by Ambedkar and Nehru as the flagship of modernisation and a radical revision of Hindu law...it is widely regarded as dramatic benchmark legislation giving Hindu women equitable if not superior entitlements as legal subjects." ^ Kulke, Hermann; Dietmar Rothermund (2004). A History of India. Routledge. pp. 328. ISBN 0415329191. http://books.google.com/?id=TPVq3ykHyH4C&pg=PA328. "One subject that particularly interested Nehru was the reform of Hindu law, particularly with regard to the rights of Hindu women..."
^ Forbes, Geraldine; Geraldine Hancock Forbes, Gordon Johnson (1999). Women in Modern India. Cambridge University Press. pp. 115. ISBN 0521653770. http://books.google.com/?id=hjilIrVt9hUC&pg=PA115. "It is our birthright to demand equitable adjustment of Hindu law...."
^ Robert Sherrod (19 January 1963). "Nehru:The Great Awakening". The Saturday Evening Post 236 (2): 60–67. ^ Dua, B. D.; James Manor (1994). Nehru to the Nineties: The Changing Office of Prime Minister in India. C. Hurst & Co. Publishers. pp. 141, 261. ISBN 1850651809. http://books.google.com/?id=X90G8gnoqv4C&pg=PA141. ^ a b Frank, Katherine (2002). Indira: The Life of Indira Nehru Gandhi. Houghton Mifflin Books. p. 250. ISBN 039573097X. http://books.google.com/?id=0eolM37FUWYC&pg=PA250. ^ Noorani, A.G. "Perseverance in peace process", Frontline, August 29, 2003. ^ Embree, Ainslie T., ed (1988). Encyclopedia of Asian History. 3. New York: Charles Scribner's Sons. pp. 98–100. ISBN 0684188996. ^ Harrison, Selig S. (July 1956). ""The Challenge to Indian Nationalism"". 'Foreign Affairs' 34 (2): 620–636. ^ "Padma Awards Directory (1954-2007)". Ministry of Home affairs. http://www.mha.nic.in/pdfs/PadmaAwards1954-2007.pdf. Retrieved 26 November 2010. ^ a b Thapar, Karan (17 August 2009). "Gandhi, Jinnah both failed: Jaswant". ibnlive.in.com. http://ibnlive.in.com/news/gandhi-jinnah-both-failed-jaswant/99323-37.html. ^ "After Advani, Jaswant turns Jinnah admirer". The Economic Times. 17 August 2009. Joseph Stanislaw and Daniel A. Yergin (1988). "Commanding Heights". New York: Simon & Schuster, Inc.. http://www.pbs.org/wgbh/commandingheights/shared/pdf/prof_jawaharla.pdf. This page uses content from the English language Wikipedia. The original content was at Jawaharlal Nehru. The list of authors can be seen in the page history. As with this Familypedia wiki, the content of Wikipedia is available under the Creative Commons License.